Editor’s note: Steve McDonald is a senior advisor on the Africa Program at the Woodrow Wilson Center. The views expressed are his own. As a young Foreign Service Officer assigned to the American Embassy in Pretoria, South Africa, in the late 1970s, I was assigned to cover “black political affairs,” which meant getting to know and interacting with the majority population and its leaders during the height of the racist Apartheid government’s rule. While I met almost all of the key African leaders of the day, it was not possible to meet Nelson Mandela, although I did try. The African National Congress (ANC) was in exile in those years and Mandela had been in prison since 1964. However, I could begin to take the measure of the man, because Madiba, as he was fondly called then and now, was never far from anyone’s thoughts or prayers. Mandela was the “leader” in every black person’s mind. I left South Africa in 1979, and it would be more than a decade before I would actually meet the man. In that time, Mandela’s legend would grow, and his leadership became more firmly entrenched, even while he was in prison. The South African Apartheid government, recognizing his central role as a leader, would come to realize that the only way to avoid a huge confrontation of epic proportions was to begin to negotiate with Mandela for a way out. Throughout the 1980’s, I was in and out of South Africa constantly, on various work related trips, or visiting family, as I had married a South African. During most of that decade, South Africa was under a vicious state of emergency with thousands of people dying in violent townships, the tightening of the police state apparatus, growing ANC sabotage and no seeming way out but ultimate Armageddon. Mandela worked silently and diligently behind the scenes from his cell on Robben Island, and then in his more relaxed house arrest in Pollsmoor Prison on the mainland, to urge restraint and common sense, while making sure no one misunderstood the final goal: a South Africa in which all people had equal rights in a democratic state. From letters and secret messages to verbal prompts to visitors, Mandela remained the central guiding figure of the struggle. In 1990, after years of painstaking and persistent behind-the-scenes negotiations with President P.W. Botha and then President F.W. De Klerk, Mandela walked out of prison a free man. He was to engage in a negotiation process with all parties, from left to right, work through the formulation of a new democratic constitution, and help bring the country to its first ever truly democratic elections in 1994. Once president, he took on the critical and necessary task of reconciliation between white, black, colored and Indian in this deeply divided society. He formed a unity government, inviting De Klerk, who had lost the election, to stand beside him as one of the deputy presidents. He oversaw the establishment of the Truth and Reconciliation Commission to address past violations of human rights. He reconciled with Chief Mangosuthu Buthelezi, the leader of the most powerful opposition black party, who had also stood for and lost the election. Mandela also met with General Constance Viljoen, the head of the South African Defense Forces, who had formed a rightest party of his own and had enough arms in white militia hands to set back the transition to democracy. Viljoen became an important ally. From 1991 to 1994, Mandela was the critical element in bringing about an agreement that allowed there to be a democratic South Africa, and then to hold that fragile state together in its first four years while its populations came to grips with this new entity and their new reality. Made up of over 10 distinct African ethnic groups, mixed race individuals called “coloreds,” Indians whose ancestors had come to work the sugar cane fields, and a mishmash of white ethnicities born of the colonial and settlement era, to include, at least, English, Afrikaner, Dutch, German and French, with a number of Scotsmen thrown in, this “new” South Africa was a volatile brew. Mandela held it all together. The first order of business in 1991 had to be a system of governance that was democratic and sacrosanct. When finished, the constitution and its bill of rights became a model for the whole world in its protection of the rights of all. In 1994, with the foundation laid, Mandela had to turn to reconciliation, and no other human being could have accomplished it. How he did it is still considered a miracle by some. It started with his in-born sense of inclusiveness, of always understanding opposing views, “walking in the shoes of the other,” and taking the interests of all into account. That reads like a manual of conflict resolution training, but Mandela did not learn this from books, rather from “Ubuntu,” which in the Nguni languages of Southern Africa means a sense of humanity that binds us all. His commitment to that concept was the saving grace for a South Africa that could have erupted into irretrievable violence. In practical terms, Mandela understood that all South Africans had to be in this together or the new “Rainbow Nation” would not succeed. This meant some compromise from past principles, often to the despair of his closest followers, but he showed no favoritism and equally called out his fellow ANC activists, as he did white opposition leaders for any breach of the unity he know South Africa had to have. His instinct and wisdom knew no bounds, and his greatest legacy will be a South Africa, still separated in opposing political camps, but where all South Africans are proud of their nationality and unity. And, through it all, he never lost his human touch, which, after all, was the cornerstone of his philosophy of Ubuntu. Mandela was accessible, giving of his time freely for his work, international visitors, and the average person. He was a family man with a deep commitment to his children and grandchildren, most of whom he had not seen for years. He was a nightmare for security personnel as he greeted everyone, mingled on the street, in a soccer stadium, at the airport, anywhere and anyone. 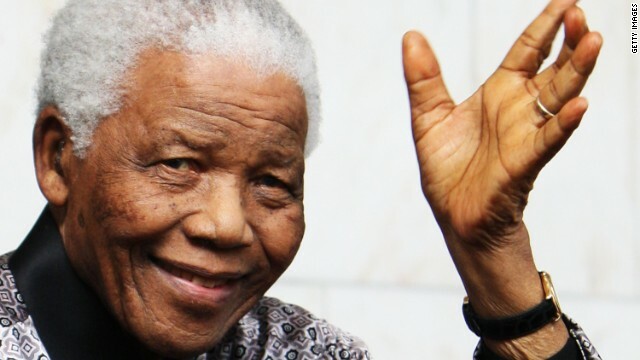 It was this attribute that not only endeared him to South Africa and the world, but made him the trusted and effective interlocutor who could bring South Africa out of the fire and into the world community as a full and free partner. Mandela has become an icon to the whole world, but he would be the last person to ever describe himself that way. He knew he had an historic moment and an important role to play, but he always saw himself as a soldier among many in the struggle of freedom, equality, and democracy, and his constituency the people of his beloved country. This was a great man indeed. He did the same thing in South Africa that Gen. Wojcek Jaruzelski did in Poland. I remember how Pres. Reagan handled the white rulers of South Africa of his time with kid gloves while vilifying Gen. Wojcek Jaruzelski to no end, referring to him as "that Russian general in a polish uniform". I serious doubt that Reagan would be very sincere in eulogizing Nelson Mandela while shedding his alligator tears over him today. This again just proves how these right-wingers always stick together! Beautifully posted, Joseph. It's like a breath of fresh air seeing an intelligent comment like yours after reading all the ignorant things other people had to say on this website. I agree, Nelson Mandela was one of the greats. What does mandela teach us about terrorism? What kind of answer are you looking for ? Mr. Mandela taught peace and tolerance. He spent 27 years in prison because of his activism against the wrongs to his people. When he was released, he held no ill will and brought about the end of apartheid. Why would you try to connect this mans name to terrorism ? What kind of answer are you looking for ? Mr. Mandela taught peace and tolerance. He spent 27 years in prison because of his activism against the wrongs to his people. When he was released, he held no ill will and brought about the end of apart heid. And taking it a step further. Even though He was labeled a terrorist, one must ask the question, why ? Because he rose up against the cruel rule of a minority white supremacists terrorist group. ? Because he dared challenge the world accepted legal segregation ? Because he dared to dream of freedom for his people ? Take your pick. I can understand why any of these reasons would be cause to label one a terrorist. You know banasy, I could understand him being labeled terrorist if he were following some type of ideology such as the push for Islamic supremacy or even if his goal was to overthrow the ruling party just to replace it with another dictatorship. But his one and only goal was to get his people from under the suppressive rule of the white supremacists. Though I agree that other tactics could have / should have been taken in the early days, the options were few. All in all, the fact of the true nature of his push, in no way defines a terrorist. Nope. And I get tired of reading that the ruling elite that Mandela was fighting against should have been given a pass because, well, they were white. As if that justifies the horrendous suppression that apartheid was. I have read that disturbing opinion more times than I'd like to admit. I read one guy, posting as PW Botha, say that Mandela was a whiner, and was well taken care of for the 27 years he was in prison. I hope it was a joke. Actually, Nelson Mandela, Nikolai Lenin and Abraham Lincoln were truly three of a kind. None of these men will be replaced as they now belong to the ages! Let's now stop the ignorant rants here and now. This is not a Tea Party Convention! And who, precisely, is doing that, Felix? How funny that R. Wilson Reagan just posted the same thing. And even used the name Nicolai, which isn't generally used when talking about Lenin. You two are in the sane wavelength. Or something. Still, I am in awe at how the two of you are so similar on thinking. I think that is spectacular, Felix. Two kindred spirits. Agree that Mandela is a man for the ages. A book was once written which encapsulated a people's belief in an ideal. This was Thomas Paine's "Common Sense". Nelson Mandela spent 27 years in prison due to principle's he believed. Think for a moment, how many men do you know who would take such personal action. Mandela had the blending of the perfect spirit, great vision, compassion, forgiveness and the missing leadership quality common sense. Prejudice finds it's way into most thinking and when can solve this quality in human thinking we can get on with the business of surviving the real struggles we have as a species on a small planet in a immense universe. Instead of focusing on what makes us different, people should focus on what we all have in common. I like to think outside of the box. A tired cliche, to be sure; I tend to dislike the mob mentality. Then real leadership finds a means to teach usually through example, wisdom, and the most important thing humility. The problem is most people want someone to solve their problems. Mostly the problem of individuals is a opportunity. With the leadership today, they are through incompetence running the future of opportunity into the ground by limiting the choices of young people. The is a general theme of the loss of fairness. Big business is running the government by using the resourses of the people through foreign policy to extend their markets through the use of military assets paid for by the dwindling middle class. Jobs are sent overseas by policies created through the lobbists all the while this paradigm is destroying the financial core of America. Those making this policy are getting super rich while the country collapses and they can't see it because they are focused on the money. World governments don't mind if we go broke solving a terrorist problem. Terrorism is partially caused by the policies of western governments by a focus on their own pockets rather than than following the age old dogma of joining government to serve. Human existence through the current political perspective on this planet is being played like it's a game and the outcomes have no real consequences.